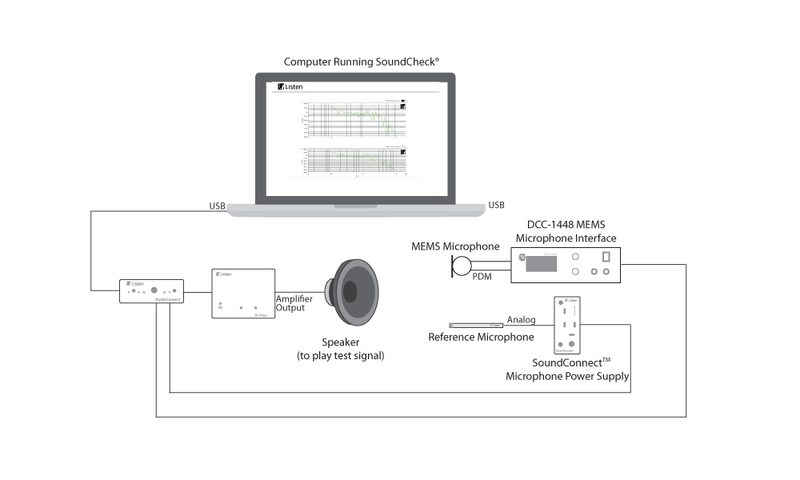 Measuring Digital MEMS Microphones – Listen, Inc. This sequence demonstrates the two most common microphone measurements on digital MEMS microphone: frequency response and sensitivity. A stepped sine sweep is played from 10 kHz to 100 Hz through a source that has previously been calibrated to produce 1 Pascal across the frequency band. 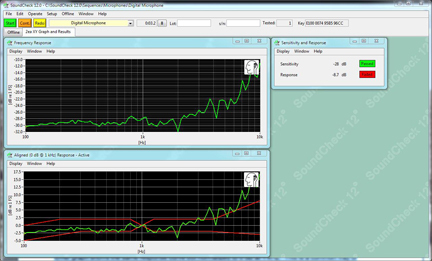 The recorded signal is analyzed with a HarmonicTrak analysis step, which calculates the response curve. A post processing step is then used to extract the level at 1 kHz, the sensitivity value. Limits are set around both the frequency response and the sensitivity, the default values are for a typical MEMS microphone and should be adapted to your particular device. The final display shows two graphs. The top X-Y graph displays the data at its absolute level in dBFS. The lower graph shows the same response curve but normalized to 0 dB at 1 kHz. This is a common way of displaying microphone frequency response and applying limits. 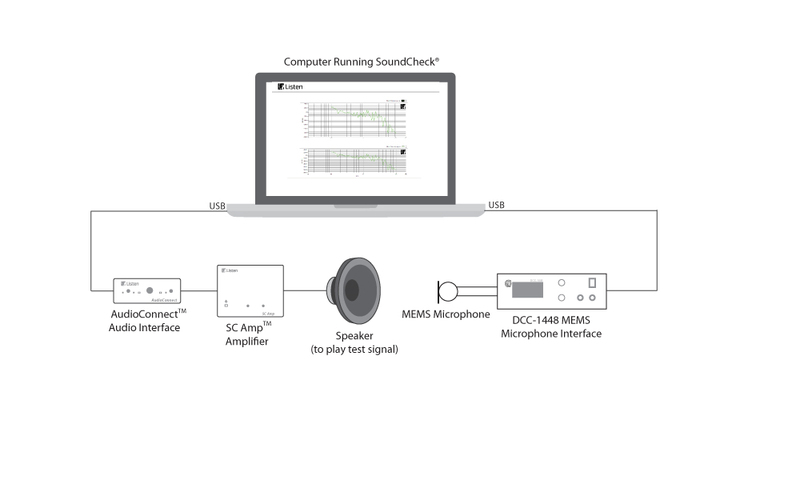 This sequence demonstrates a method for testing a digital MEMS microphone frequency response with a source speaker that is not or cannot be equalized. The method involves playing a sine sweep through the source and simultaneously measuring it with a reference microphone and the microphone under test. Because the measurement microphone is assumed to have a relatively flat response, it is used to acquire the frequency response of the source speaker. 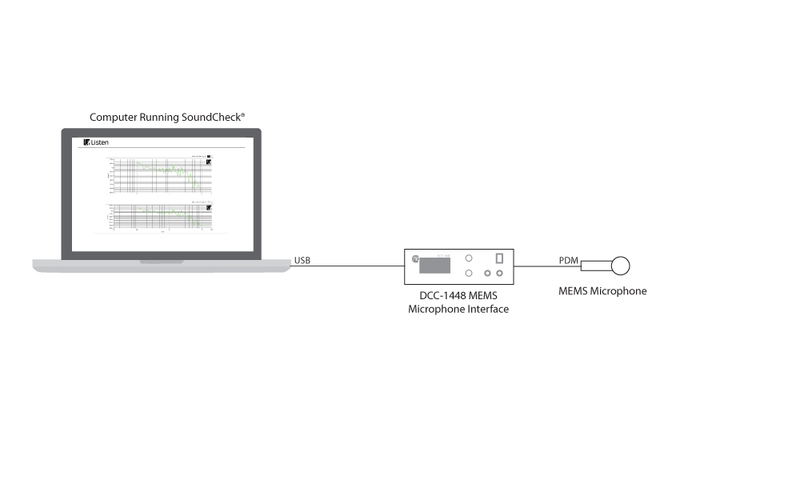 By subtracting the response of the reference microphone from the DUT microphone the response and sensitivity of the device under test is revealed. Limits are set around both the frequency response and the sensitivity, the default values are for a typical MEMS microphone and should be adapted to your particular device. This sequence demonstrates a method for measuring a digital MEMS microphone’s power supply rejection performance (PSR). The PSR of a microphone reflects the ability of the device to reject or suppress external electrical interference. Such sources have historically been dominated by 50 and 60 Hz hum from electrical mains, but the 217 Hz GSM TDM pulse is now often of greater concern. This sequence measures PSR at 217 Hz but is easy to modify to test at any frequency. The test is based on using a Portland Tool and Die DCC-1448 to provide a digital MEMS microphone with a DC supply with a calibrated AC signal, simulating electrical interference. SoundCheck then records the audio from the DUT, analyzes it with a spectrum analyzer and extracts the RMS energy at the specific frequency of the simulated electrical interference and returns the PSR value. The setting of frequency, waveform type and amplitude of the simulated electrical interference is controlled entirely from within SoundCheck. Calibrate the source speaker as per the instructions in the SoundCheck manual. Connect the MEMS microphone and digital MEMS interface per Digital Microphone Test Configuration Notes. Calibrate the measurement microphone as per the instructions in the SoundCheck manual. This test is entirely electrical. You may need to mechanically mute the microphone if PSR performance is exceptionally low or ambient acoustic noise is very high.